Maoists have ruled Nepal for almost a decade, after helping end centuries of monarchy. But hard-liners disappointed by their record are returning to the armed struggle. In 2006, after ten years of armed struggle, Nepal’s Maoists signed a peace agreement with the government and embraced electoral democracy. Eighteen months later the Nepalese people rewarded them at the ballot box, as the Maoists won thirty percent of the vote in the constituent assembly elections. Outside of China, where Mao Zedong took power after the 1949 revolution, Nepal is the only country where Maoists (together with other Left parties) have led the national government. The changes of 2006–8 also saw the party play a key role in turning Nepal from a monarchy into a federal republic. Yet Nepal’s Maoist movement is today divided. In July 2018, twelve years after the historic peace agreement, I interviewed several of its top leaders, who have now split into two broad camps. The establishment Maoist camp, led by Prachanda, has united with other parliamentary-left parties and has eschewed the path of armed struggle. The breakaway dissident faction, led by Mohan Baidya “Kiran,” has denounced the “counterrevolutionary” compromises by the establishment faction and has raised the slogan for renewed People’s War. I met up with Mohan Baidya, better known by his nom-de-guerre, Kiran, and his wife and comrade Sushmaji. I sought to understand why Kiran, an erstwhile member of the Maoist party’s own politburo, and the country’s best-known radical hard-liner, has denounced the peace process and the Maoists’ transition to democratic methods, instead favoring a return to the old ways of armed struggle. But first, the history of Maoists in Nepal. The Communist Party of Nepal (CPN) was formed in 1949. Even in its first years, it played an important role in overthrowing the Rana regime that had ruled Nepal since the 1846 coup against the Shah dynasty. But in 1951, the Shahs were restored to power and the following year the CPN was banned. In the 1960s, the CPN fragmented into many smaller groups, after the split between the USSR and Mao’s China. A reformist faction that controlled the CPN’s central committee backed the King when he orchestrated a coup to take absolute power. Dissidents left the party in rejection of this inadmissible compromise, but they themselves then split into several factions. Through the 1970s, several attempts to unite this revolutionary Left failed. During this time, the prevailing political system in Nepal was a party-less “guided” democracy (the so-called Panchayat System) in which the people could elect their representatives, but the real power remained in the hands of the monarch. A series of student protests in 1979 forced the King to hold a referendum, under universal suffrage, on the question of replacing the guided democracy with a multiparty system. But the status quo prevailed and attempts to democratize Nepal were temporarily thwarted. Amidst this political upheaval, the radical left factions in Nepal were primarily represented by the CPN (Masal) platform led by Mohan Bikram Singh (MBS). In early 1980s, Kiran led a revolt against MBS’s leadership and broke away to create CPN (Mashal), with an h.
This latter faction affirmed Marxism-Leninism-Maoism as its party ideology. In line with this ideological position, it called for an armed struggle with the aim of instigating a mass popular uprising against the King and the “guided democracy” regime. In this attempt at armed struggle, CPN (Mashal) attacked a few police posts in the capital and defaced a statue of the monarch. However, these actions failed to inspire the popular imagination and prematurely exposed the party’s underground organization, leading to the arrest of several activists. Faced with severe internal criticism, Kiran resigned as General Secretary. He was replaced by Pushpa Kumar Dahal, a charismatic young Central Committee member, then known by as “Biswas” (meaning Trust) and eventually proclaimed as “Prachanda” (the Fierce One). It is said that Kiran was the “kingmaker” who handpicked young Prachanda and mentored him as the future leader of Nepal’s Maoists. When several radical-left factions united to form the CPN (Unity Center), Kiran and Prachanda each took part. However, in 1996 a faction led by this pair left the CPN(UC) and formed the CPN (Maoist). Almost immediately afterwards the Maoists launched the ten-year People’s War, primarily demanding the abolition of the monarchy. In June 2001, the monarchy in Nepal suffered a severe setback when a mysterious shootout wiped out the entire royal family. Amidst several rounds of clashes between the Maoists and the state, the new king declared a state of emergency in 2002, sacked the entire cabinet and postponed elections indefinitely. Under the state of emergency, through 2004-5 the King clashed with the parliamentary parties as well as the Maoist rebels, amidst international concerns about an imminent humanitarian crisis in Nepal. Political parties in Nepal formed a united opposition to call on the King to relinquish power and reinstate the parliament. By the end of the ten-year war, the Maoists declared that they were ready for peace talks in May 2006 on the condition that the government agreed to establish a constituent assembly tasked with writing a new constitution, and also to include the Maoists in the subsequent unity government. The postponed elections to the Constituent Assembly were finally held on April 10, 2008. The Maoists emerged as the largest party with 30 percent of the vote. Sooner afterward, on May 28, 2008, the Constituent Assembly declared Nepal to be a federal democratic republic effectively abolishing the monarchy — a significant victory for the Maoists. Despite this achievement, however, the party split in June 2012 with Kiran walking away with several other senior leaders to form a separate Nepal Communist Party (Maoist). 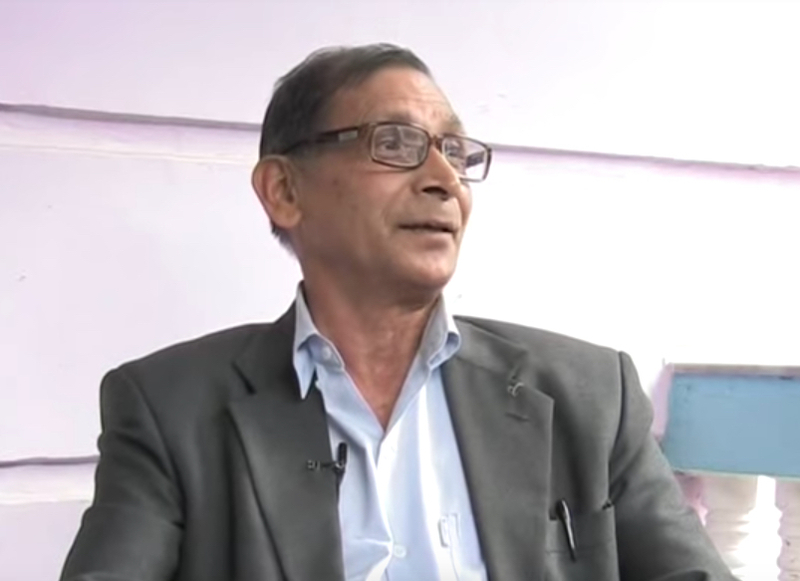 Kiran, who had been in an Indian prison during the peace process, was critical of many of the decisions by Prachanda and Dr Baburam Bhattarai, the top leaders representing the Maoists during that process. In the interview, Kiran emphasizes that the biggest mistake of the establishment-Maoist leaders Prachanda and Dr Bhattarai was to agree to disband the People’s Liberation Army (PLA) that had fought the People’s War, without consolidating their gains and securing all their demands in a constitution. Kiran elaborates his assessment of the state character in Nepal, asserts that the revolution is incomplete, and lays out a plan for the future armed struggle. What is your assessment of the current conditions in Nepal? Unlike India, Nepal was never directly a part of the British Empire. Therefore, technically it was not a “colony” of any foreign power. But that does not mean that Nepal was immune to prolonged exploitation by foreign imperialist powers. Over time the nature of oppression, by external powers or by Nepali feudal classes, has no doubt evolved. However, through these superficial changes, the subjugation of Nepali people, either by colonial powers or by the feudal classes, continues uninterrupted even today. For example, Nepal signed the Sugauli Treaty Nepal with the British East-India Company way back in 1816. Nepal had to concede a part of its territory to the British and even allow the British army to recruit the Gurkhas for military service. What did Nepal get out of it? Nothing of substance. That was open colonial exploitation. Again, in several treaties signed between Nepal and India since the 1950s, you can see how the Indian state established its hegemonic control over the natural resources of Nepal. We are talking about the ruling classes in India. I have nothing against the ordinary people of India, who are also exploited by their political masters. But that is a different matter altogether. Nepal’s most significant natural resource is its water. But Nepal signed treaties which allowed the Indian state to control our natural resources, meaning that it literally controls our hydropower. But the ordinary people in Nepal hardly see it. It’s carefully hidden. This is the neocolonial exploitation of Nepal. Nepal is a landlocked country. Its vital transport routes for trade pass via India. Recently a treaty was signed on this issue with China, but it’s not yet been implemented. Thus, India unilaterally controls Nepal’s trade and does not provide any concession on transport services in return. Further, the trade deficit between Nepal and India is around $70 billion. To reduce the trade deficit, we need export-oriented industries. However, domestic production of export goods is meager, whereas imports are very high. The government does nothing to correct this, for instance subsidies or initiation funds to farmers or factories to increase domestic production. In the hilly regions of Nepal, fertile cultivable land is left unused. Nor does the state does provide our youth with any help or encouragement to cultivate these lands. They are forced to migrate to foreign countries, like Malaysia or to the Gulf or even India, for a livelihood. No opportunity is offered to harness the rich human capital and the natural resources of Nepal. This is what I call neocolonial exploitation. The ruling classes of Nepal are comprador capitalists [i.e., ones in a dependent, “bought-off” relationship toward foreign capital] who only try to appease the Indian state in order to remain in power. The Indian state micromanages everything in Nepal, including bureaucratic appointments. It even encroaches on Nepal’s territory. There are more than sixty places along Nepal-India border where the pillars demarcating borders have disappeared. For example, India has encroached on Nepali land in the Lipulekh tripoint pass of Nepal, in Darchula district of far-western Nepal. In 2015, China and India bilaterally agreed to set up a trading post there, completely ignoring Nepal’s interest. Our party did protest, but our ruling elites did not even object to this, as they genuflect to the Indian state. That is how neocolonialism works. You have said that protracted armed struggle — another people’s war — is the only way to accomplish your goal of a new democratic revolution in Nepal. Why is this? Revolution happens when the exploited and oppressed class overthrows the exploiter and oppressor class in power. That has not happened in Nepal. The comprador bourgeoisie and the feudal classes that ruled Nepal before are still in power. That’s why the revolution is far from complete. My former comrades like Prachanda, Baburam Bhattarai, Ghanshyam Bhusal, and Ram Karki all claim that Nepal’s capitalist revolution is complete. I disagree. First, a successful capitalist revolution must lead to the development of industrial capitalism with a national character, but that’s nowhere to be found in Nepal. Instead what we have here is comprador and bureaucratic capitalism. Secondly, the New Democratic Revolution of which Maoists speak will successfully end both internal feudal oppression and external imperialist foreign intervention. Has this happened? Certainly not. In Nepal, the bourgeoisie is too weak and comprador in nature. The peasants will have to lead the new democratic revolution targeted against the feudal lords, the comprador bourgeoisie, and the meddling foreign powers, and end all forms of oppression. The fall of the monarchy did not automatically end feudalism in Nepal. In China too, the monarchy was overthrown in 1911. However, the Chinese communists, once they were organized as a party in 1921, set liberation from feudalism and imperialism as their goal. This is an important point to note. Yes, the abolition of monarchy in Nepal has dealt a severe blow to feudalism but that can hardly be conflated with the end of feudalism. A real New Democratic Revolution will uproot feudalism once and for all, annul all unequal treaties, challenge all indirect exploitation by multinational corporations and global capital, and organizations like the World Bank, IMF, and WTO. We need to augment the development of the national bourgeoisie, build national industries, and do so much more to end the oppression of the people, both by India and by the global multinational corporations. The abolition of the monarchy was a key moment in the history of Nepal. One might argue that the Palace Massacre of 2001, when the Crown Prince Dipendra mysteriously murdered King Birendra and his entire family, led to the collapse of the monarchy. Further, it is public knowledge that prior to that event, the Maoists were already trying to explore opportunities for compromises, either with the parliamentary parties or with the monarchy. So, do you think that the Maoists can take credit for the abolition of the monarchy? There were two immediate reasons for the fall of the monarchy in Nepal. First, in the 2001 palace massacre the entire family of King Birendra Shah was slaughtered. When his brother, Gyanendra Shah took to the throne, he was no Birendra and the Nepali people lost faith in the monarchy. Given that the Nepali people considered the King a direct descendant of the (Hindu god) Lord Vishnu, such loss of faith is remarkable. Second, Gyanendra Shah, as soon as he ascended the throne, seized the power of parliament and became authoritarian monarch, which sparked anger amongst the people. As a result, the major parliamentary parties including Nepali Congress, CPN (UML) and others joined hands with the Maoists against the king, which paved the way for the abolition of monarchy. However, Nepali Congress and UML deny the role of the Maoist people’s war in creating conditions for the downfall of the monarchy. They single out the nineteen days Janaandolan (people’s movement) in 2006, which is a completely wrong interpretation. We think that both the palace massacre and Maoist people’s war actively contributed to the eventual abolition of the monarchy. Our armed struggle against the state was the primary reason that Gyanendra decided to act the way he did. On your question about Prachanda reaching out to the monarchy or Baburam reaching out to the seven parliamentary parties prior to the palace massacre, let me tell you yes, there were two lines within the Maoists at that time. Such internal contradictions and tactical compromises happen — there is nothing wrong with that. Theoretically speaking, in order to accomplish the goal of revolution, you can enter into a tactical alliance with any group to strengthen your side, as long as you remain true to your goal. You can always wonder “what if.” But what actually happened was that the King banished all seven parliamentary parties and took power into his own hands because he felt that these parties were ineffective in tackling the Maoist armed struggle. The King sought both to decimate the Maoists and abolish the democratic parties. This was an ill-advised and imprudent move. We immediately understood the situation and allied with the other parliamentary parties to rally against him. India also stepped in and played a significant role here, by brokering some of these challenging conversations. We entered into the twelve-point agreement with the parliamentary parties, which pledged to work towards democracy, peace, prosperity, social advancement, and the abolition of the monarchy. During this time, I myself was not in Nepal; I was languishing in prison in India. While the twelve-point agreement was a high point of Nepali politics, a much more significant event rocked our party in 2005. A fissure in our party cracked open during a Central Committee meeting at which the Prachanda-led faction abandoned the goal of New Democratic Revolution and adopted democratic republicanism as their new goal. They tried to craftily frame this as a transitional slogan, a mere tactical adjustment. We did not agree. In retrospect, once the Prachanda-Baburam group put forward the ideas of the democratic republicanism of the French Revolution as appropriate for today’s Nepal, we were already on a slippery slope. This was an openly capitalist slogan and marked the beginning of the end of Maoist politics under their leadership. When I met Dr Baburam Bhattarai, he highlighted that since India, China, and the United States actively interfered in Nepal, it was only “pragmatic” to make some tactical compromises. He said that it was acceptable to forgo Maoist labels and slogans like the People’s War and New Democratic Revolution to preserve the gains of ten years of people’s war and to achieve the important goals of democracy, federalism, and inclusion. Such slogans, he claimed, were out of sync with the post 9/11 world, where Maoists could be labeled as “terrorists” much to the detriment of the people of Nepal. If some tactical compromises help you achieve the larger goals of revolution, what’s wrong with such adjustments? I understand your question. Baburam’s justification is not convincing. His ideas were not just a matter of tactical compromise. Back then, it was probably nothing but reformism. But, given everything he has done in the subsequent years, he has proven us right. He has formed a party named “Naya Shakti” (New Power), an explicit mashup of Marxism and liberalism, on the grounds that neither can work alone. Isn’t that ridiculous? As far as tactical adjustments to preserve the gains of revolution, that’s all right. Such tactical compromises can be made within the limits of theory and the real advancement of strategic goals. But when you surrender the fundamental theoretical premises of Marxism, Leninism, and Maoism, your deviation from the path of revolution is complete. What are your plans to accomplish the revolution? Aside from China, which too eventually deviated from the Maoist path, there has been no model of a successful Maoist revolution. Do you have a road map to accomplish the New Democratic Revolution in Nepal? We recognize that the Maoist movement in Nepal has suffered a serious setback, primarily owing to the deviation and betrayal of our top leadership. But we do not believe that the Maoists have lost. We have neither lost nor won. The people are yet to experience any positive change in their day-to-day lives and continue to experience the same oppressive conditions. The plight of our people will provide fertile ground for us to engineer another revolution. But there are some serious challenges. First and foremost, we need to win over the trust of the people all over again. So many of our senior comrades, once the leading faces of courage and struggle, have accepted the bourgeois parliamentary system and nonrevolutionary way of life. Some of them have assumed positions that are outright counterrevolutionary. Further, many of these former Maoists abandoned communist principles altogether. They have assumed the class character of our antagonists—the Nepali Congress and the Nepal Army. This causes confusion among ordinary people, who have started to express doubts about our intentions and about the communist ideology in general. Our immediate challenge is to ideologically expose these counterrevolutionary elements and regain people’s trust. However, after the splits, our organization is currently too weak. We have to rebuild our party to expose these fake Maoists. As they fail, they will open up space for those of us, who have not strayed from the path of revolutionary politics. It might take several years, so we must persist. On this question of persisting after a setback, I’d like to ask you about the trajectory of revolutionary left politics in India. The Naxal movement of the 1960s and ‘70s, as you know, was decimated. Through many splits, however, they regrouped and resurfaced three decades later to challenge the state again. The former Prime Minister of India called them “the biggest internal security threat the country has ever faced.” In my own research, I have found that militant mass mobilization programs, particularly by the People’s War Group, with its emphasis on creating organic leadership and real social transformation at village level, had contributed to their success. Would you agree? Have you taken any lessons from the experience and trajectory of the Indian Maoists? We have been advancing our mass movements in Nepal as well. While we believe in the strategic importance of mass movements, we do maintain that we would need to prepare for armed struggle as well, in order to succeed. We cannot win with mass movements alone. During my meetings with Maoist cadres, I have heard about the popularity of party campaigns against country liquor and domestic violence in villages. Do you have any such mass mobilization programs undertaken by your party? I do not think these were examples of mass movement in the Maoist sense. If these things happened anywhere, it was wrong. These are very much against the way of life of people, particularly the indigenous people (janajati) who use liquor unreservedly. It is part of their homegrown culture. Our current mass movement programs focus on issues that are directly related to the class struggle. We mobilize people against the local feudal landlords (zamindars) and money lenders on the issues of land rights, fair prices for agricultural produce, fair share of produce for landless farmers, fair wages for agricultural workers, and against usurious loans. I understand your critique of the politics of Prachanda and Baburam. But there are others, like Netra Bikram Chand (Biplab) and Gopal Kirati who also favor continuing the armed struggle. But they are separate organizations. Why are the factions critical of the establishment Maoists in Nepal unable to unite? I can tell you that this is a matter of deep introspection within our party as well, and we are making serious efforts to resolve this. All I can share at this moment is that unity cannot happen merely on the basis of agreement on the political line alone. There are additional practical barriers to unity such egocentricity of the leadership, political careerism, and unnecessary adventurism all of which have to be handled effectively before we can achieve unity. We are sincerely trying to unite the factions that you mention and will continued talks with them. After the peace process, former combatants have reintegrated back into the society or into the Nepali army. Do you think this generation will take up arms against the state all over again? You’re right. I know the people of Nepal feel disappointed in us. They can see that the Prachanda faction does not care about their issues anymore. They do not have much faith in us either, primarily due to our lack of unity. When people witness factional strife among us they will not trust us. We need to be united to inspire popular confidence in us as the alternative platform of resistance. We will continue to work hard towards that. On the question of reintegration of former combatants, this was a huge mistake. Within our party Prachanda and Baburam agreed internally that we would structurally change the Nepali Army. But what really happened was that some Maoist soldiers were reintegrated into the Nepal Army. However, you must know — only a very small fraction of the PLA soldiers joined the Nepal Army. Most of the former PLA just disarmed and left the containment under which they had been placed by the peace deal. But they are out there. They are not under the government’s control, even today. They are scattered here and there. Some are in the party, some are working in regular jobs, some have left the country. The commander of the PLA is now the Vice President. But many of them are with us. Many others are just watching us and will eventually come back to us. And we will recruit new soldiers. During the ten years of people’s war, we were very successful in recruiting people into the PLA and in winning over popular support. We value that experience. We will do that again. Thanks to Naresh Gywali, a journalist with the Nepali daily, Naya Patrika, for her assistance with this interview. Mohan Baidya is the chairman of the Communist Party of Nepal-Revolutionary Maoist. Rumela Sen is a postdoctoral research fellow at Columbia University.